Last week I was scrolling through my Facebook feed at around 6 am. I noticed a headline from the Society for Human Resource Management (SHRM) page I follow. (I’ve included a screen shot for reference.) The first line reads: Throw Back Thursday and Scrunchies are back. Having worn a few scrunchies in my day, I had to click on the link. 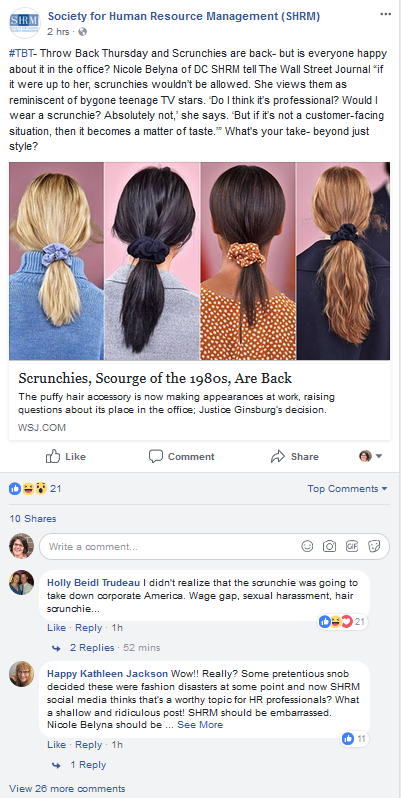 That SHRM decided to post the article struck me as odd—are scrunchies a worthy topic to post about on a professional organization’s Facebook page? The tie-in for throw-back Thursday was clever, but it also made me question the judgment of the person behind the Facebook account. remind readers about other (more serious) topics about which they regularly post. If we’re communicating with an audience and readers via social media, we can learn a lot from this experience.Your followers are watching what you do. They are smart. And, they have a voice. When you’re engaging with your community, be judicious about what you share on social media. And be ready for each and every possible reaction. In the case of what I now refer to as the “SHRM Scrunchie Debacle,” I came away impressed by their social media team. Did they really intend to “start a discussion”? Maybe…or, maybe not. But once the discussion began, they didn’t run and hide. They didn’t delete the post. Instead, they responded and reacted in a sincere and meaningful way. Hopefully the sincerity and appreciation they expressed is what their Facebook community will remember.